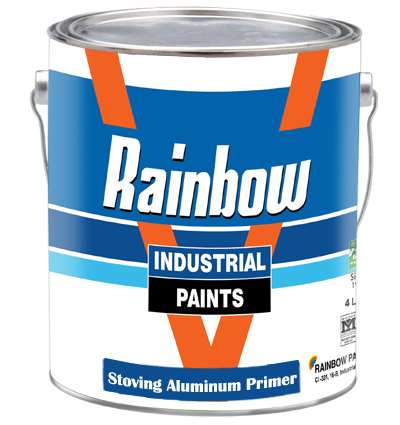 RAINBOW STOVING Aluminum primer is formulated as base coat for stoving flamboyant paint for metallic luster finish. Composition: Rainbow stoving aluminum primer is based on Alkyd/ Melamine with aluminum powder/paste for metallic luster. Covering Capacity: 10-12 sq. Meter / Litter (Single Coat). Film Thickness: 25-30 Micron. Application: Airless or conventional spray. Shelf life: 6 month in properly sealed container kept at room temperature.